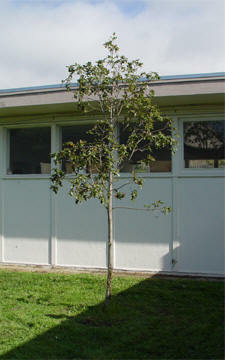 OneTrees was first exhibited in San Francisco at Pond in 2003. 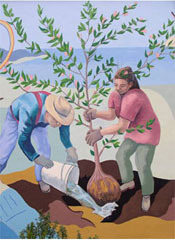 In celebration of its one year anniversary, the OneTrees exhibition will travel to Sanchez Art Center. The work included in this exhibition (sculptures, prints, and installations) expands on themes explored in OneTrees and is authored by a group of artists including youths from the Boys & Girls Clubs of SF and the SF Art Institute. “the growth responses of trees is a history we can learn to read"
OneTrees is a citywide enviro-social sculpture that encourages individual action and encourages dialogue around contemporary environmental issues. The project involves the planting of pairs of genetically identical trees in 18 public places throughout San Francisco’s diverse microclimates. As the trees are biologically identical, in the subsequent years they will render visible the social and environmental differences to which they are exposed. Current sites planted between 1999 and 2004 include Bernal Heights, Berkeley Art Museum, Tilden Park, various Palo Alto parks, Sanchez Art Center, the San Francisco Art Institute, Warm Water Cove, and others. OneTrees involves various long-term and short-term components and is currently in the midst of securing signage for each pair of trees. How is OneTrees exhibited in a gallery setting? What will I see at Sanchez Art Center? 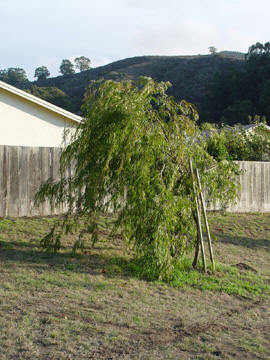 OneTrees was first exhibited in San Francisco at Pond in 2003. 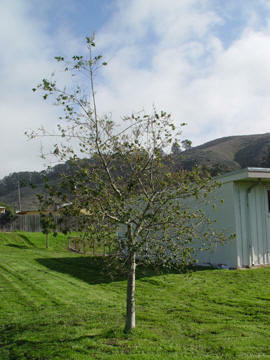 In celebration of its one year anniversary, the OneTrees exhibition will travel to Sanchez Art Center in Pacifica, California, a OneTrees site and venue that seeks to create visual art experiences that significantly transform the lives of youth and families in the community through outreach and education programs, public exhibitions, and affordable studio space. The work included in this exhibition (sculptures, prints, and installations) expands on themes explored in OneTrees and is authored by a group of artists. The bulk of artwork by Natalie Jeremijenko, OneTrees originator, employs various high and low tech media that give form to otherwise abstract or evanescent phenomena, challenging the viewer to reconsider the immediate urban environment. Formally engaging and art-historically allusive, the exhibition's various components contain a strong political message: in highlighting the differences between genetically identical organisms, Jeremijenko's work dismantles the fallacy of genetic determinism (the belief that genes determine form) and affirms the significance of environmental influence. Q: What kind of tree is a OneTrees? 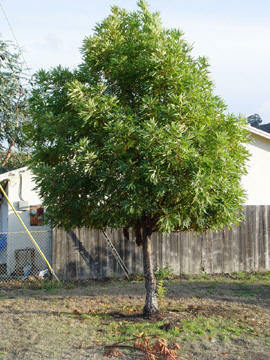 OneTrees is actually a Paradox Walnut, a fast-growing hybrid first found in California in the mid 19th century by Luther Burbank and known to mature within a human lifetime (80 years). 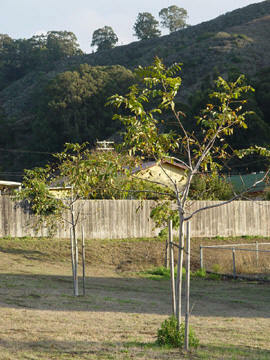 Enamored with its fast growth and beauty, Burbank cultivated the Paradox in an effort to create a fast-growing hardwood. A fast-growing hardwood was a paradox (puzzle) because it usually took a long time to grow a hardwood. This paradox walnut wood could then be used to make furniture and would be ready to harvest much sooner than other hardwoods. 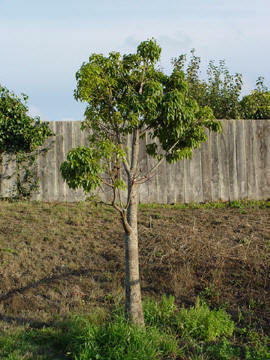 Other sources attribute the tree’s name to the naturally occurring paradox exhibited by hybridized species in which a hybrid offspring may not display characteristics of either of its parents. Specifically, when the black walnut flower is fertilized with the English Walnut, its offspring, the Paradox walnut, will occasionally throw a paradox—it is much more vigorous than either of its parents, growing much larger and faster. Magnificent, vigorous, and beautiful trees noted for its pleasant smell, the Paradox Walnut is an ideal urban tree: it does not produce pollen (walnut pollen is an allergen to many people); does not drop nuts (the city authorities discourage fruit and nut dropping tree in urban contexts because they constitute a ‘tripping hazard’ and as such pose litigation risk); has deep-water seeking roots (i.e. the roots are less likely to pull up pavement or interfere with piping and underground services); and can withstand the difficulties of surviving in the urban environment. Q: What is Pond’s relationship to OneTrees? Pond is a non-profit all-volunteer organization dedicated to showcasing experimental public art. 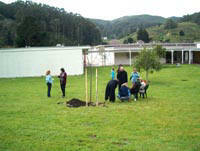 Located in San Francisco, Pond has collaborated with Jeremijenko on various levels, has organized the tree plantings, and has worked as a fiscal sponsor to the project. Q: How can I get involved with OneTrees? What volunteer opportunities exist? 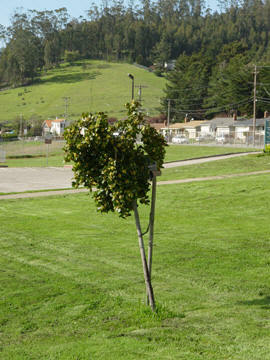 Q: How does planting the trees in diverse local ‘microclimates’ help us understand San Francisco’s different biospheres? What defines a ‘microclimate’? A ‘microclimate’ is a small localized area in which the climate differs from the general climate due to the variances in precipitation, humidity, heat and access to light, soil conditions, particulate matter, carbon dioxide levels, CO2 levels, and many other pollutants and environmental stressors. Microclimates can occur in localized areas due to nearby man-made features. First exhibited at Yerba Buena Center for the Arts in 1998/99, OneTrees has morphed into a citywide environmental social sculpture that encourages individual action and dialogue relevant to issues in contemporary environmental debates. 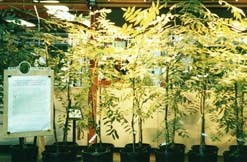 In 1998/1999, artist Natalie Jeremijenko developed the project OneTrees, actually one thousand tree(s), clones, micro-propagated in culture. The clones were exhibited together as plantlets at Yerba Buena Center for the Arts, San Francisco, Exit Art in New York and the Exploratorium. This was the only time they were seen together. 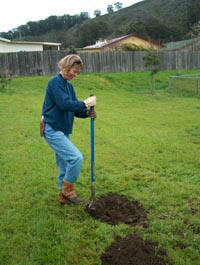 For the past several years many of the trees have been growing in a nursery in Mendocino. The time has finally come for the trees to be sited in their permanent homes. We are currently coordinating the plantings of 100 pairs of genetically identical trees in public places throughout San Francisco¹s diverse microclimates. The project's various short-term and long-term components provide an opportunity for communities to engage the project at its various stages. As the OneTrees are biologically identical, in the subsequent years they will render the social and environmental differences to which they are exposed. 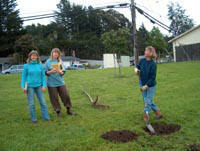 The trees' growth will record the experiences and contingencies that each public site provides. Each of the tree(s) can be compared by viewers in the public places they are planted, to become a demonstration, a long, quiet and persisting spectacle of the Bay Area's diverse environment. Essentially, OneTrees functions as a dynamic instrument that maps the microclimates of the Bay Area. OneTrees is actually a Paradox Walnut, a fast-growing hybrid first found in California in the mid 19th century by Luther Burbank and known to mature within a human lifetime (80 years to be exact). Magnificent, vigorous, and beautiful trees noted for its pleasant smell, the Paradox Walnut is an ideal urban tree: it does not produce pollen (walnut pollen is an allergen to many people); do not drop nuts (the city authorities discourage fruit and nut dropping tree in urban contexts because they constitute a tripping hazard¹ and as such pose litigation risk); has deep-water seeking roots (i.e. the roots are less likely to pull up pavement or interfere with piping and underground services); and can withstand the difficulties of surviving in the urban environment. Current existing planting sites include the Bessie Carmichael Elementary School (Marina district), Yerba Buena Center for the Arts (Soma), the San Francisco Art Institute (North Beach), and the garden at the foot of a pedestrian stairway at Cumberland and Castro (Castro district). In May of 2003, documentation of the planting sites and related interpretive material will be showcased in a gallery exhibition curated by Pond. 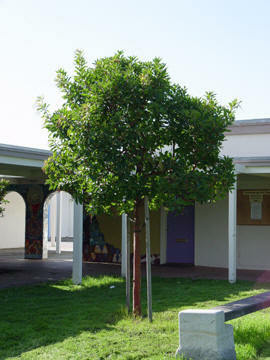 Related OneTrees projects include a collaborative public art project at the SFAI tree site created by youths from the Boys and Girls' Clubs of San Francisco, students at the San Francisco Art Institute, and lead artist Amy Berk. Additional components include a bike tour of the tree sites, a bike map, panel discussions and a lecture series. Natalie Jeremijenko, 1999 Rockefeller fellow, is a design engineer and technoartist. She was recently named one of the top one hundred young innovators by the MIT Technology Review. Jeremijenko did graduate engineering studies at Stanford University towards her Ph.D. in design engineering, and was most recently the director of the Engineering Design Studio at Yale University developing and implementing new courses in technological innovation. She has recently taken a research position at the Media Research Lab/Center for Advanced Technology in the Computer Science Dept., NYU. For more information about Natalie Jeremijenko's related projects visit http://cat.nyu.edu/natalie or http://www.onetrees.org.